You're listening to a track from our forthcoming CD "Previn Plays Previn," to be released at our Silver Anniversary Gala October 31 at Symphony Hall. Boston. 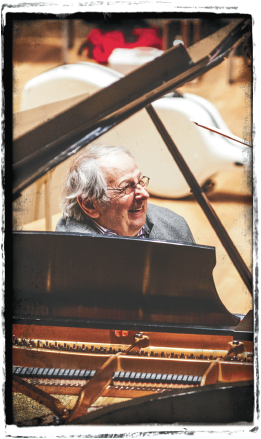 This is the third movement of the Sonata for Clarinet and piano by André Previn, recorded live at its world premiere at the Prague Spring Festival. 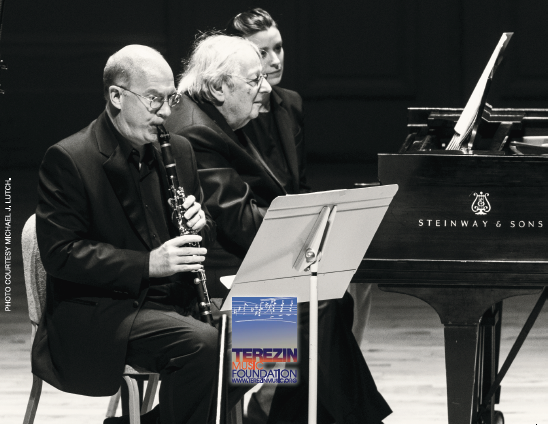 ​It is performed by Previn himself and Boston Symphony Orchestra Associate Principal Clarinetist Thomas Martin. Previn composed this piece specifically for Mr. Martin to perform. "I knew Tom's playing and admired it. And I've worked with him before. . . . And I was really looking forward to writing for Tom." This CD also features André Previn's Quintet for Clarinet and String Quartet, recorded at its world premiere at Boston's Symphony Hall, with Thomas Martin, clarinet, and the Hawthorne String Quartet. It will soon be available online, watch for our announcement. JOIN US at our Gala to receive a signed copy of this CD. Photos above by Michael J. Lutch. BSO Clarinetist Thomas Martin: "something far beyond a dream!" "I’ve admired André Previn as a musician, conductor, and composer all my musical life. In recent years I’ve had the opportunity to get to know André personally, and I admire him also as a person of upmost integrity, intelligence, and wit. I was eleven years old when a friend of mine introduced me to an LP of him performing a composition of his with clarinetist Benny Goodman. I was immediately smitten. In the 1970s I was glued to a television set for every episode of 'Previn and the Pittsburgh.' The first time I worked with André was my very first year as a member of the Boston Symphony Orchestra. It was August of 1985 at the Tanglewood Music Festival. I remember him walking on stage and feeling a dream had come true. During a 2002 BSO rehearsal of his Violin Concerto with Anne-Sophie Mutter as soloist and André conducting, I thought, 'this is a violin concerto but the clarinet writing is absolutely superb. André Previn has to write a piece for the clarinet!' It took me several years to gather the courage to ask him, but when I did, he couldn’t have been more gracious! Having the opportunity to perform a clarinet sonata written for me by André Previn with André himself at the piano? Now that is something far beyond a dream! Add to that, André composing a quintet for clarinet and strings? How far over the moon are we now???"